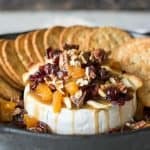 Baked Brie with Dried Fruit, Nuts, and Butterscotch – baked brie just became a little more exciting with the addition of some dried fruit and nuts. 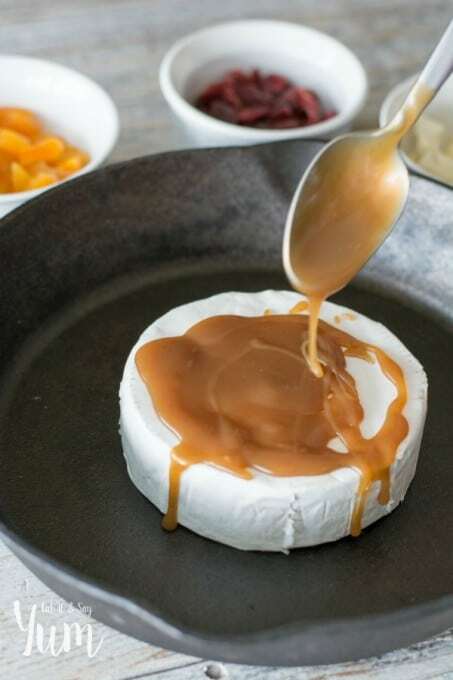 Remember to add the drizzle of butterscotch so you can hear that extra, “Oh, wow!” when guests bite into this easy appetizer! With the holidays in full swing, I know you are looking for something special to take to your next get together. This appetizer is full of flavor and will impress all your friends. 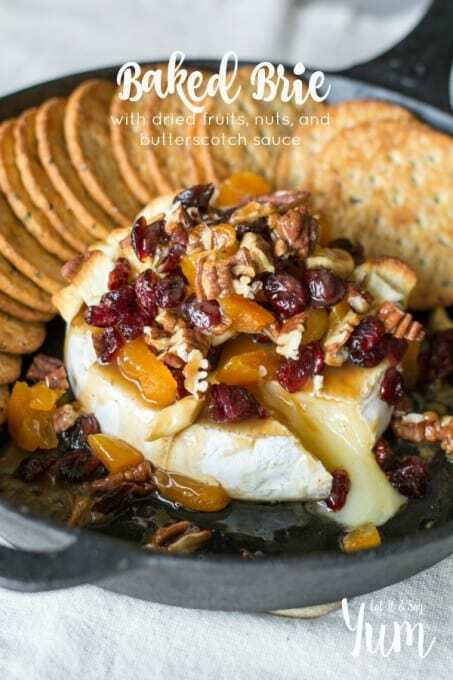 While very easy to make, this baked brie looks beautiful, and is so flavorful. 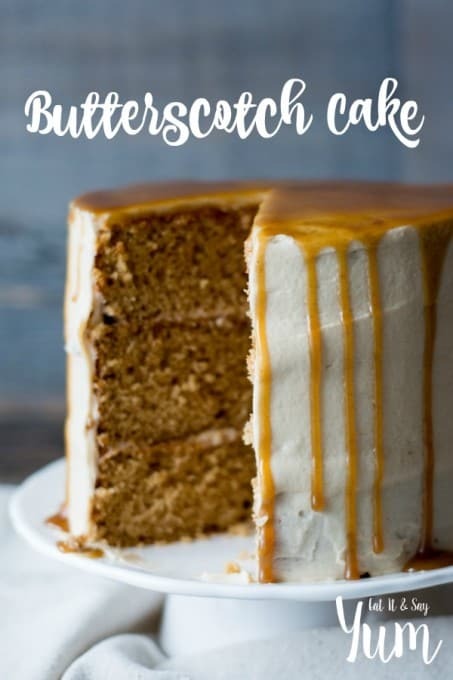 You can use butterscotch or caramel sauce from the store, but I HIGHLY recommend trying out my Spiced Molasses Butterscotch recipe for this dish. The hint of spice just makes this appetizer even better. Start with the brie and drizzle some of my butterscotch sauce over it. Then pile on the chopped dried fruits and nuts. A little more butterscotch sauce before the dish goes in the oven, and then let it bake for 15-20 minutes. When it comes out of the oven the sauce has made its way all around the brie, and the fruit and nuts and perfectly toasty. Dig in with some crackers, or sliced baguettes. 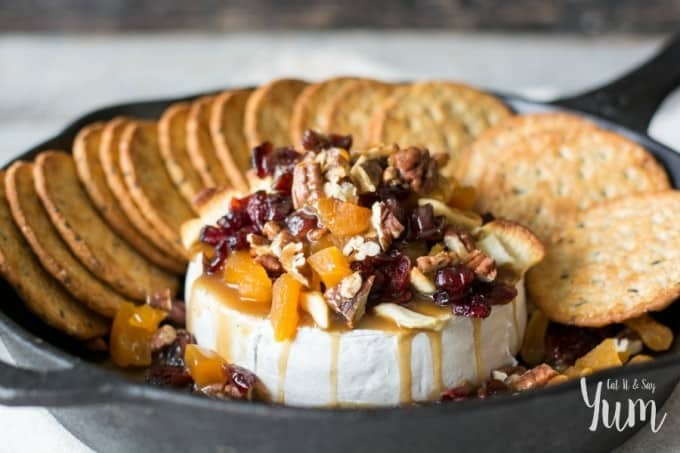 Your baked brie just became a little more exciting with the addition of some dried fruit and nuts. Remember to add the drizzle of butterscotch so you can hear that extra, "Oh, wow!" 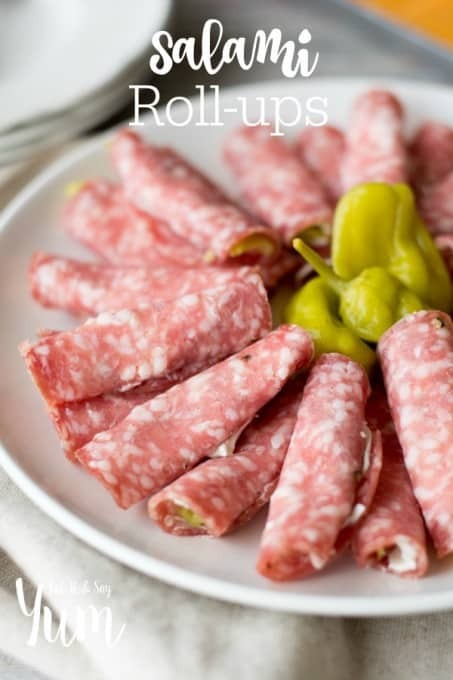 when guests bite into this easy appetizer! Chop the pecans and place them under a hot broiler for 30-60 seconds, watching them carefully. When they are nice and hot, sprinkle them with a pinch of salt and set aside. Preheat oven to 350 degrees. 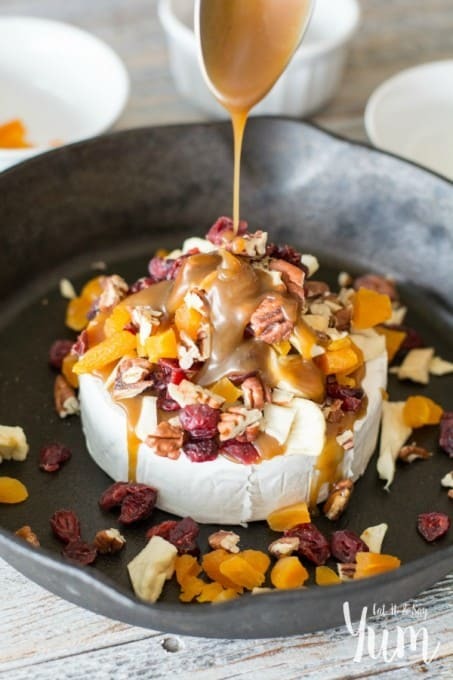 In a small cast iron pan, or other oven safe dish, place the brie and drizzle with half of the butterscotch sauce. Sprinkle all the dried fruits and the pecans over top, letting some fall to the sides of the brie as well. Drizzle the remaining butterscotch sauce over the fruit and nuts. Bake the brie for 15-20 minutes. Serve immediately, with crackers and/ or sliced baguettes or french bread. Curious as to how to put a gorgeous cheese board together for entertaining? Watch this video! 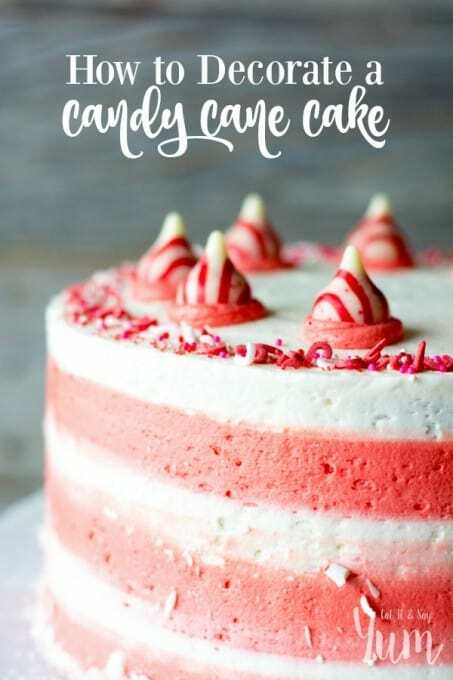 It so mouth watering and looks so yummy and tasty. Not only that it looks so healthy. I cannot wait to try this recipe. Thanks.